Odd Future, the fifteen-member hip hop proteges, can't seem to find their way out of the cavernous world of rap feuds. Last week, they received a rhythmic response to Tyler, The Creator's bash of fellow rapper B.o.B., from the artist himself. The latest battle, however, contains fewer C-words and much more irony. A heated competition has surfaced as two former rap icons, now music moguls, Jay-Z and Sean "Diddy" Combs battle with the desire to sign the blunt (pun intended) lyricists. 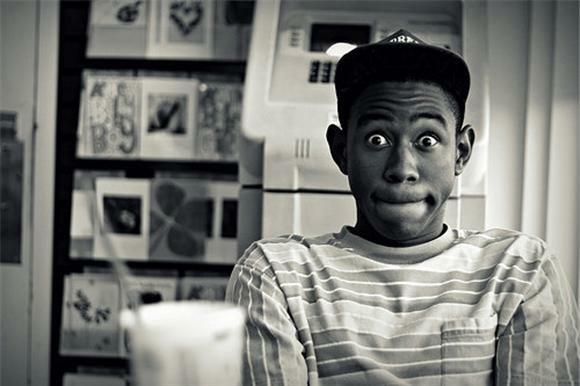 According to the New York Post, Odd Future has laid out a ransom list of demands to be followed by the eager record execs. They are available for business meetings at Supreme skate shop in Fairfax, California, and for those who desire a private setting, like SRC Records founder Steve Rifkind, certain stipulations must be followed. Tyler made it clear that he requires Randy's donuts, swivel chairs, and a megaphone. It's pretty outstanding that a 20-year-old has Jay-Z and Diddy doing back flips to please them. Although they'll eventually ink a deal with the "man", it's hard to believe that their hijack of the industry is anywhere near its demise. We can only hope that their meetings resemble their visit at the Funny Or Die offices (NSFW: Odd Future). Maybe we'll just let Tyler explain it himself.